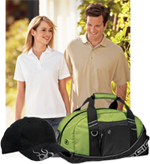 TSM Specialties can help you strengthen your brand and identity with an almost unlimited array of custom imprinted promotional merchandise, from pens and golf tees and umbrellas to top quality clothing and casual wear. If you have a logo, we can get it on almost anything - And do it at low, low prices. We'd be happy to develop a specialized graphic for any special event or for your company employee's. T-Shirts - Hats - Jackets - Silk Screen or Embroidered - TSM Does It All. Contact TSM for Ideas and Pricing! !